I’m thrilled to announce my next story in the “Entertainers of the West” series is now available. 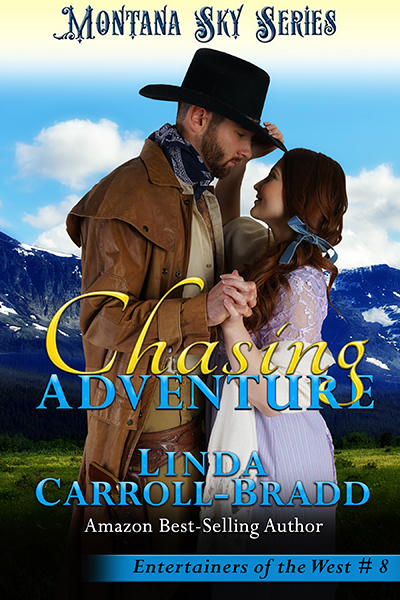 Set in the Montana Sky world established by Debra Holland’s award-winning books, Chasing Adventure takes place in the fall of 1887 in Sweetwater Springs and Morgan’s Crossing. Dime novelist, Thora Alviss, seeks out an ex-US Marshal, Harte Renwyck, for an interview, but he wants no more publicity about his past life. Determined to make her stories better, city-bred Thora rushes into exploring the frontier life. Thora’s thirst for a good story is stronger than her ability to get herself out of danger and Harte comes to the rescue time and again. Will she give up and return east, or will she learn the survival skills she’s been writing about? Ex-US Marshal, Harte Renwyck, has left his past behind and looks for no more acclaim, but a pesky author wants to interview him about his former profession. While Harte can’t deny a growing respect for her efforts to make her stories stronger, he’s been wronged by the press in the past and fights to keep his distance. 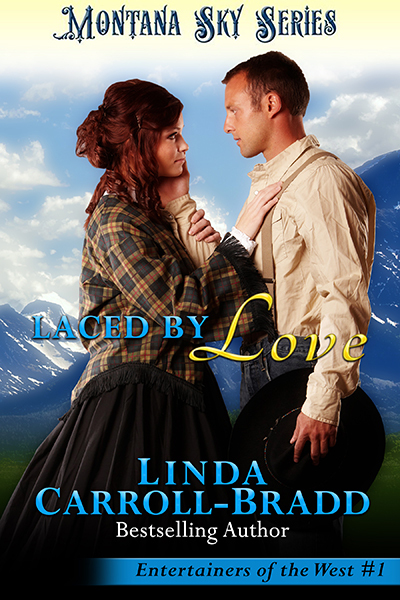 Can he look past his prior grudge and see the adventurous woman close at hand? At her words, Harte narrowed his gaze. She sought a man but hadn’t made arrangements for said man to meet her? Strange. The woman’s face paled, and Harte edged close, fearing she might faint. If ever a woman was out of her element, that person was Miss Alviss. “I’ll help the lady, Jack.” Before thinking through the situation and realizing what he obliged himself to, he’d opened his mouth and made the offer. Why not? He had to walk in the same direction to return to the office and could carry a bag or two. A stroll through town with a pretty lady on his arm could prove a pleasant diversion. He thought back to the last time he’d walked out with a woman. A casual activity he hadn’t enjoyed in too many months to count. Or could even be years. Miss Alviss flashed a smile, creasing a dimple at the left corner of her mouth. “What a truly chivalrous and gentlemanly offer, deputy. I do admit to being a bit travel weary and the assistance is much appreciated. I thank you from the bottom of my heart.” Giving a nod in his direction, she continued up the steps. Lofty praise for lending a neighborly hand. When was the last time he’d had such pretty words aimed in his direction? Moving with the speed of Mercury, Harte vaulted the steps to the platform and rounded the corner of the depot office. A small mountain of luggage comprised of a portmanteau, two valises, two carpetbags, and a satchel squatted beside a wooden bench. His boots skidded to a stop. Looked like he’d be the one making multiple trips. “Oh, dear.” She let out a sigh. “In New York City, the porter used a push cart, and the quantity of my bags didn’t pose such a problem.” She dashed forward and grabbed the satchel, lifting the long strap over her head so it rested on her opposite hip. Then she leaned over and reached for a carpetbag. Knew she was from a really big city. Not wanting her to strain anything, Harte moved to her side. “I offered, although I didn’t know you had so many pieces. But I’ll manage. Somehow.” For a man accustomed to traveling light, he couldn’t imagine what she packed inside all these cases. “Duly noted, miss.” His words came out more clipped than he intended. Years of dealing with criminals had stolen his ability for idle talk. Setting his jaw, Harte hoisted the portmanteau to balance on his left shoulder then stooped to grab the handles of the matching carpetbags. “If you lift the valise, I can stretch my fingers around the handle.” Barely, but for his pride’s sake, he needed to make the offer. The corner of the leather case dug into his shoulder, and his right hand already ached from the weight. “Head toward the brick building down a ways on the opposite side of the street. The boardinghouse is past the mercantile.” He trudged down the steps, each move jolting his shoulder muscles. The lady’s rigid posture and swishing bustle informed him she still resented his thoughtless remark. Not exactly how he envisioned his morning walk through Sweetwater Springs. Chivalry, my backside.